Do you really know how the 18 to 49 year old market, better known as Gen X and Gen Y, is changing and what this means for your marketing, especially where social media and mobile are concerned? If not, this research is crucial to your marketing since these two market segments live and communicate via social media and they research, connect and purchase with their mobile devices. Therefore you must move from being present on social media to integrating social media into every aspect of your business to be where your customers are when they want to engage with you. Indie Women. These are a growing segment of single women who don’t have children and have chosen a solo living alternative to having a traditional family. Actionable Marketing Implications: Indie women need a variety of different support systems to fulfill needs and supplement services traditionally provided by family members. The autonomous mindset of these independent women is redefining household structures, relationship dynamics and products and services for the life of one person. Marketers must get rid of their old stereotypes to win over this segment! Personal grid. Gen X and Gen Y view local as personal, flexible and transportable. Actionable Marketing Implications: There’s been a fundamental shift in how people navigate through their lives and interactions with others across their work and personal lives. Marketers must be able to connect via smartphones and tablets to be part of the purchase process. Pop-Upreneurs. A new breed of instant entrepreneurs enabled by new platforms that facilitate transforming their ideas into reality, is disrupting the status quo. Technology is allowing them to find new, easier and cheaper ways to accomplish their goals. Actionable Marketing Implications: Embracing a beta-test mindset, this segment thrives on fast, democratized creativity. They’re creating solutions to problems and finding more profitable ways to circumvent established hierarchies and ways of doing business. Marketers have a difficult time competing with them since they’ve got less overhead and other costs. With this segment, some businesses may do better to hire them and work with them rather than compete. Popular “Click”. These are the hyper-connected tastemakers and curators encompassing influencers, stylists, bloggers and celebrities who are taste and cultural arbitrators. Actionable Marketing Implications: They’ve become an integral part of the social commerce ecosystem connecting marketers and customers. Consider how you can leverage the power of your brand’s influencers. Group Think. This segment puts a new positive spin on an old negative business concept. Gen X and Gen Y use a collective intelligence model focused on getting as much top talent together to find the best idea. Actionable Marketing Implications: This is a shift from mass crowd sourcing to seeking specialized skills to provide solutions for specific problems and needs. When it comes to social media, marketers get a lot of it right according to Gen X and Gen Y consumers. Over 70% of respondents interact with brands on social media either regularly or occasionally and among the top trendsetters this rate increases to 90%. While this sounds great, the marketing challenge is to convert this engagement into sales. At least half of them think that brands are effective at getting their attention. This sentiment is higher for the top 5% who are trendsetters as well as the younger segment. Here are six data points regarding Gen X and Gen Y attitudes towards marketers and brands on social media based from The Curve as reported in Adweek. 21% Believe most brands just try to accumulate as many friends, fans or followers as possible but don’t take the right steps to build a real community. 18% Think brands’ efforts on social sites just generally don’t seem authentic. 17% Say brands constantly try to interact with me on social media sites and it’s becoming a turn off. 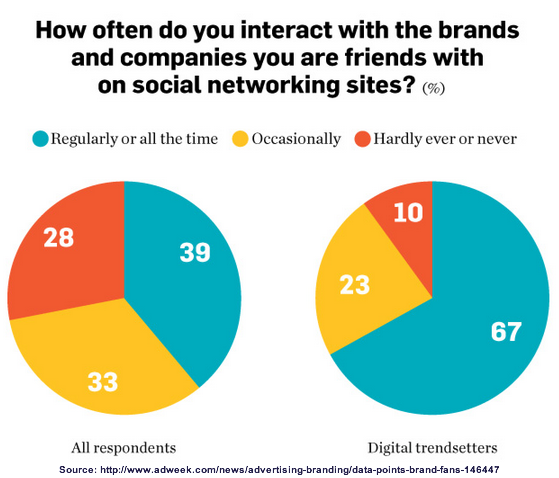 9% Think many brands on social media sites aren’t the type of brands I like to talk about with my friends. Actionable Marketing Implications: In 2013, marketers must go beyond just putting up a social media page and going through the motions of being engaged. You need to actually engage and build community in order to reap the benefits of your investment. Marketers must assess how to integrate these changing views and needs into their marketing plans and social media engagement to maximize returns. What has your experience been engaging with Gen X and Gen Y on social media? How to improve your social media profile. Tags actionable marketing, AdWeek, Gen X, Gen Y, NBC Universal, Research, The Curve. Bookmark the permalink. Fantastic blog post. This is one to keep as a map. I’m in the first wave of GenX and I can say these five trends (esp 1 and 3) are reflected in how I engage and structure my life. It’s especially helpful to have data to back up what I know from personal experience and will be using this as I fine-tune some projects I’m getting ready to launch. Wow, cool graph will be sharing this with my readers. Good work! 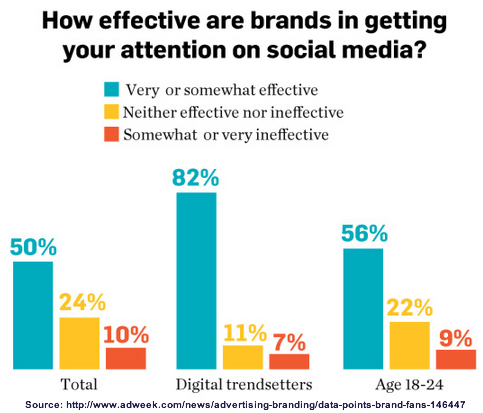 I would have thought “How effective are brands…” chart would have received an even lower satisfaction rate. Still, a lot of room to improve across the board!